Why would anyone practice Mahayana or Zen for that matter if there were not some foundational motivating factor to begin with ? I.e - the recognition that suffering and dissatisfaction is evident and that these teachings present methods and insights to uproot the causes of those . 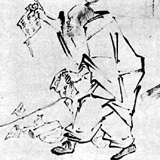 Many people are interested in the mysticism or insight it offers; Bankei Yotaku for instance became fixated on the idea of "bright virtue"/mingde (a Confucian term originally) and wanted to understand it. This led him to Zen eventually. Is no doctrine a doctrine? "None. We don't have any." I wonder what the Platform Sutra (more Zen doctrine) would have to say about this issue? I'm sure it says plenty of things, that anyone can interpret whichever way they want. My teacher, Zen Master Dae Kwang Sunim, commented on this once. He said "Zen is unique in that it promotes no teaching and no techniques.". Pretty sure he knows what he's talking about given that he's been a zen monk for 30 years and a zen master for 20 of them. "To say I have a doctrine to give people would be to deceive you. I just untie bonds by whatever means, provisionally calling this 'samadhi'." "Our school has no verbal expression, and not a single doctrine to give people." "The canonical teachings of the Three Vehicles are just remedies for temporary needs. They were taught to meet such needs and so are of temporary value and differ one from another. If only this could be understood, there would be no more doubts about it. Above all it is essential not to select some particular teaching suited to a certain occasion, and, being impressed by its forming part of the written canon, regard it as an immutable concept. Why so? Because in truth there is no unalterable Dharma which the Tathāgata could have preached. People of our sect would never argue that there could be such a thing. We just know how to put all mental activity to rest and thus achieve tranquillity. We certainly do not begin by thinking things out and end up in perplexity." How important are these to Mahayana and what source text do they get it from? By now, I do hope that you've realised that 'Mahāyāna' isn't a single entity but a spectrum of lineages and teachers, each with their own emphasis of how and when the 4NT & 8FP applies and under what context in teaching and practice. The chief sources would be from the Tibetan Kangyur & Tengyur as well as the East Asian Tripiṭaka collections, classical Śāstras to modern summaries of teachers. If you're hardworking enough, the forum's search engine or Google may be of some help on past thread discussions to find out the specs from each tradition within the 'Mahāyāna'. Does Zen follow the Four Noble Truths? If so what texts do they get it from? The texts cited are as found in the East Asian Tripiṭaka collections (ranging from the Āgamas [and in these post modern times, citations from the Pali texts] to Mahāyāna texts), Śāstras and modern summaries of teachers, too numerous to list them all here. "Those who grasp at emptiness slander the Sutras by maintaining that written words have no use. Since they maintain they have no need of written words, they should not speak either, because written words are merely the marks of spoken language. They also maintain that the direct way cannot be established by written words, and yet these two words, 'not established' are themselves written. "When they hear others speaking, they slander them by saying that they are attached to written words. You should know that to be confused as they are may be permissible, but to slander the Buddha's Sutras is not. Do not slander the Sutras for if you do, your offense will create countless obstacles for you. "One who attaches himself to external marks and practices dharmas in search of truth, or who builds many Bodhimandalas and speaks of the error and evil of existence and non-existence will not see his nature for many eons. I am pretty sure he does too. No doubt about it. Kind of paradoxical to have a master of nothing though, isn't it? So quite obviously there is something there. And that is my point all along: Saying one his no doctrine is a doctrine. Grasping to the idea(l) of no doctrine is an obstacle, it is like continuing to take a medicine once the sickness is gone. I am pretty sure he does too. No doubt about it. Kind of paradoxical to have a master of nothing though, isn't it? So quite obviously there is something there. I asked him a similar question once, along the lines of what are you a master of? He picked up a cup of tea and drank some. So there is something there, there's a cup of tea. But drinking tea isn't a doctrine, it's just drinking tea. Likewise with chopping wood and carrying water, etc. Sure, but teachers not teaching a doctrine is not the same as grasping to some idea. My teacher's teacher used to say "You must attain nothing!" So yes, it's kind of paradoxical. But if you are not grasping at ideas, then a paradox is not a problem. There doesn't have to be "something else there", other than a cup of tea or an oak tree in the courtyard, etc. An oak tree isn't a doctrine, it's just an oak tree. My friend, we (humans) manage to make a self out of five piles of non-existence. So making a doctrine out of nothing and then clinging to it is a piece of cake for us!